Manning Florist specializes in event flower arrangements. Whether you need a ballroom design for your company holiday party or an intimate wedding anniversary party, or designs for a cocktail party. 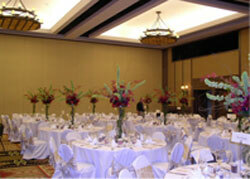 Manning Florist is your event specialist. Manning Florist has been putting elegant touches on parties and events since 1995. For personal attention to your floral details, and a design expertise unparalleled in Albuquerque, trust the flowers for your next event to Manning Florist. Yes, we do wedding flowers too!